Donnie Yen’s Ip Man film series is so popular that it has spawned a spinoff film called Master Z: Ip Man Legacy. Set in Donnie Yen’s Ip Man universe, Max Zhang, aka Jin Zhang, reprises his role as Cheung Tin Chi, a Wing Chun expert who fought alongside Ip Man in Ip Man 3. He’s joined by Dave Bautista (Guardians of the Galaxy) and Michelle Yeoh (Crazy Rich Asians; Star Trek: Discovery; Crouching Tiger, Hidden Dragon). Behind the scenes is director Yuen Woo-Ping, who’s known for the martial arts choreography seen in The Matrix and Crouching Tiger, Hidden Dragon and his Hong Kong classics like Fist of Legend and Drunken Master. In our interview, Zhang chats about being a part of a film set in the Ip Man universe and working with Dave Bautista and Michelle Yeoh. What is it like continuing in the Ip Man and Donnie Yen film universe? Max Zhang: I am thrilled that Cheung Tin Chi is the first character in the Ip Man cinematic universe to get their own standalone movie. I hope the audience get to see what he can do. How did the idea start to have Max return as Cheung Tin Chi in his own movie? Max Zhang: Tin Chi was quite a unique character in Ip Man 3. Since the movie’s theatrical release, there was a significant amount of audience who were fond of him and curious about his backstory and Wing Chun style. The film company took those into consideration and began brainstorming Tin Chi’s own movie. While doing so, they kept true to his personality in Ip Man 3 and built more upon that. In this film, you will get to see Tin Chi more fleshed out on top of what was portrayed in Ip Man 3. How did Dave Bautista get involved in the project? Max Zhang: Director Yuen wanted a strong opponent for Cheung Tin Chi to go up against, and we hoped for impressive characters to join the cast. And so, Dave Bautista of Guardians of the Galaxy came to mind. He is a tall guy with a strong build and a professional wrestler. It would be difficult for Tin Chi to fight or overpower him. Director Yuen wanted the audience to enjoy an exciting onscreen showdown between us. What is it like acting with Michelle Yeoh and Dave Bautista? Max Zhang: Michelle and I have known each other since I did stunt work in Crouching Tiger, Hidden Dragon, but this is our first time collaborating both as actors. I really admire her work, and needless to say, she was amazing in this movie. There was a slow-mo shot where we fought with weapons, and Michelle was extremely precise in her blade technique and successfully swiped off the tips of my hair. I feel like we have a certain affinity in movie work. It’s been more than ten years since we met in Crouching Tiger, Hidden Dragon, and I’d never thought that we would work together again now. I am really grateful that she joined the making of this film. Towards the beginning of filming the action scenes, Dave was not used to Director Yuen’s style. After he watched the rough cut on the third day, he became more confident and picked things up super fast. Our fighting speed needed to be swift, but due to our height difference, I needed to attack Dave’s top, bottom, left, and right. His arm is much longer, too; I used a lot more energy fighting him compared to my other opponents. However, this was the effect we wanted; for it to be near impossible for Tin Chi to defeat Davidson unless he uses Wing Chun. Dave is a great actor. He is very friendly and nice. We worked together on another movie with Sylvester Stallone, not long after Master Z wrapped, and we all became friends. What can audiences expect from Cheung Tin Chi’s tale compared to Ip Man’s story? Max Zhang: The biggest distinction between Tin Chi and Ip Man is that they are complete opposites in terms of personality and fighting style, as reflected in their Wing Chun techniques. Ip Man has mercy on his opponents, while Tin Chi does not. If Ip Man takes down an opponent, he would probably pick them up off the floor after, but Tin Chi would want to end you with just one punch or kick. Master Z reverts to the fundamentals of Chinese Kung Fu. We tried avoiding choppy edits or fancy shots so the audience could focus on the techniques and aesthetics of the Kung Fu style. There is a cool fight between Tony Jaa and me on the streets, and a weapons fight with Michelle Yeoh. Dave and my confrontation is the ending fight of the movie. Another scene to look forward to is the chase and fight on Signs Street. The film is filled with different martial arts style and is sure to entertain the audience. I hope everyone will like Cheung Tin Chi. 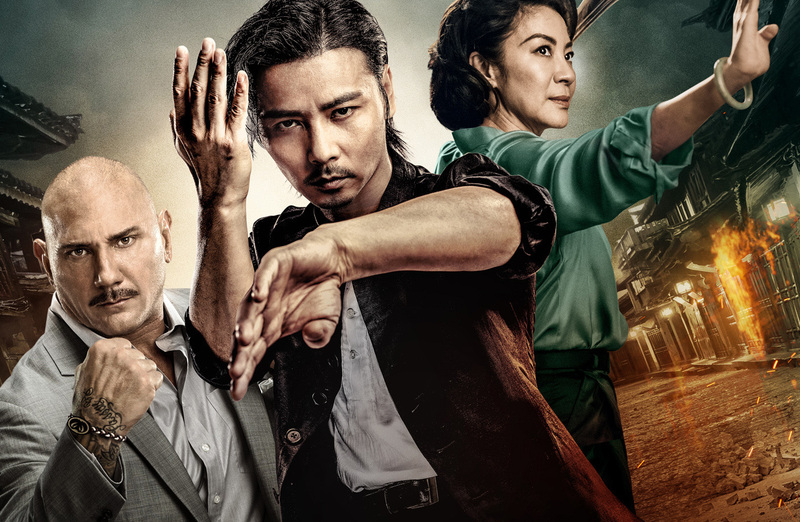 Master Z: Ip Man Legacy hits U.S. theaters on April 12, 2019. The post Max Zhang on Master Z: Ip Man Legacy and going up against Dave Bautista appeared first on Nerd Reactor.